Over at Pedal Finder, they’re having a nice, simple and easy give away – a chance to win a Outlaw Effects Five O’Clock Fuzz! These Outlaw Effects are all about the size, or lack there of. Slim / micro enclosures with big tone. A little while back I posted a press release from Outlaw Effects letting you know about a couple of new pedals coming out – The Five O’Clock Fuzz and Boilermaker Boost. 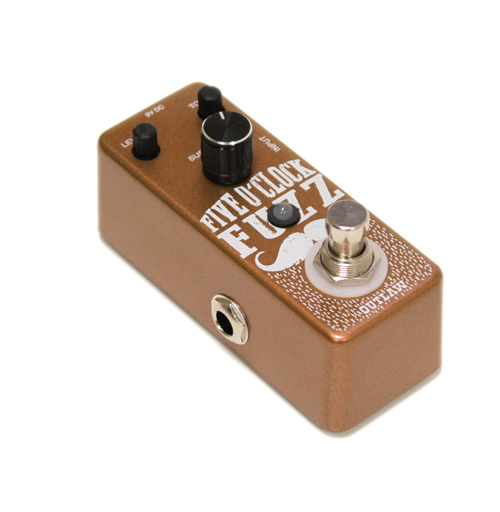 Five O’Clock Fuzz offers plenty of rich, cascading sustain with crisp attack and subtle compression, delivering a wide array of fuzz tones in a compact package. Featuring Sustain, Tone, and Level controls, this micro mustachioed marvel covers sounds from waxy smooth, violin-like sustain to grittier tones with razor-sharp bite. Sculpt your fuzz tone into everything from the thick leads of 1970’s classic rock to heavier alternative sounds of the 80’s and 90’s. Now to get into the action on the give away, simply fill out the entry form here, they’re offering a bonus prize by liking Pedal Finder on Facebook and if you’re chosen as the random winner, so don’t forget to do that as well! The give away entry form will be available until February 25th, so be sure to get on this.. and please.. help spread the word! Pedal Finder – Physics Punk Pedals Bender Fuzz Give Away Reminder Pedal Finder Give Away Pedal Finder Give Away – Physics Punk Pedals Bender Fuzz T-Rex Effects Replay Box Delay Give Away! Coffee and Riffs Part Thirty EightStupid Deal on the ModTone MT-BB Buzz Boy Power Fuzz! Source Audio Soundblox Tri-Mod Flanger Give Away!